This man is no hero. Stanley Fischer is the head of the Bank of Israel. As such, he is the government appointed goon in charge of money printing. In his infinite wisdom, he is supposed to know exactly what the supply of money should be, because he’s purportedly a chacham she-ein kamohu – a crazy genius who has a pulsating brain and somehow knows these things. Or maybe God comes to him in his sleep and tells him how many shekels should exist and how much he should print and when. Or maybe he’s just some guy who has no idea what he’s doing, given a power the equivalent of an economic nuclear weapon, something that no one man should ever, ever have. Stan the Super Shekel Man recently came out with an announcement that he would be quitting his post early. Aside from the speculation as to why (I think it’s because he knows there will be an unstoppable economic tsunami in the next 3-5 years and he wants to duck out early and quit while he’s ahead), I have seen nothing but wall to wall praise for this central planning money printing soviet-style currency czar. Sure he’s kindly, has a sweet voice, an endearing Zambian accent, cutely mixes up male and female in his Hebrew grammar all the time, and the Israeli economy didn’t totally collapse in 2008 so everyone assumes the money master is responsible for saving us all from destitution. But this is all a big, sad, sorry myth. Let’s step aside for a moment from the persona of Stan the Man himself. He as a person is not the main problem. As I said, he’s a nice guy. The main problem is the very system of central banking that give men like him inordinate power over all of our economic lives, a power which, once you realize the scope and consequences of it, can make you dizzy. Imagine for a moment two national economies. One where the supply of shoes and their price is controlled by one man and anybody else who manufactures or uses shoes besides him goes to jail, and another where the supply of shoes and their price is controlled by the free market, meaning a myriad of entrepreneurs freely importing and exporting shoes based on the demand for them by customers. In a free market where anyone can manufacture and buy as many or as few shoes as he wants, the supply, demand, and price of shoes will tend to reach an equilibrium point where profits will remain constant and steady. Shoe firms like wholesalers, manufactures, and retailers, will all compete with each other to sell the most shoes to the public. In order to do this, they will have to make shoes of the highest possible quality at the lowest possible prices in order to attract buyers. If the supply of shoes gets too high, shoe prices will tend to fall, lowering profit margins, thereby restricting the amount of shoes manufactured, choking off supply, and bringing shoe prices back up to equilibrium. If demand gets too high, shoe prices will tend to rise, increasing profit margins, encouraging shoemakers to produce more in order to earn those increased profits. This brings supply back up to match demand, bringing prices back down to equilibrium again. The shoe market in such a country would be a complete mess and everyone who needs shoes would be miserable. Since only one firm would be allowed to make and sell shoes, there would be no competition and the quality of the shoes would deteriorate. If the Chairman of the Shoe Bank of Israel set the price of shoes too low, meaning he underestimates demand, people would start hoarding the shoes and buying more than they need, and there would be shoe shortages. If he sets the price of shoes too high, meaning overestimates demand, people who needed new shoes would not buy them, instead waiting for a lower price. Perhaps they would attempt to repair their old shoes, or cut open the ends if they didn’t fit. Huge surpluses of shoes would result. Meanwhile, regardless of whether Stanley Shoemaker creates a shoe shortage or a shoe surplus in the country with his inaccurate divining of the appropriate shoe price and supply, people will have no choice but to buy shoes from him alone, and he will get richer selling them regardless of how crappy the shoes are. Nobody wants to be arrested for being a shoe counterfeiter after all. Having one man in charge of the shoe supply in a country is bad enough. But it is infinitely worse to have one man in charge of the money supply in an entire country, because the supply and demand for money controls the entire economy, shoes included. I know that the concept “demand for money” and “price of money” is hard to wrap your head around. Doesn’t everyone demand money all the time? How can it change? How can money itself have a price? Isn’t money money? Bear with me here. It is difficult for people to understand these concepts these days because fiat government currencies have ruled the world since 1971, and governments the world over have taken upon themselves the exclusive right to produce money, forbidding anything else from entering the market as money. But in reality, money, just like shoes, is a good like any other. The only difference is that money is more easily tradable than shoes for other goods. In fact, money is the most easily tradable good that exists. That’s why it’s used as money. Now, the “price of money” and the “demand for money” are reflected in many different ways. They are reflected in how much money money lenders (AKA banks) charge to borrow money, otherwise known as interest rates. If interest rates are high, then money is “expensive”. If money is expensive and money lenders can charge high interest rates, the “demand for money” must be high too. Otherwise, people would not be willing to pay such high rates in order to borrow money. If interest rates are low, then money is “cheap”. If money is cheap and money lenders are forced to lower interest rates in order to attract borrowers, then the “demand for money” must be low. The price and demand for money is also reflected in the general economy in terms of the money prices of all other goods and services. At times when the demand for money is high, forcing interest rates up, that means people want to hold more of their money (AKA save) rather than spend it. If people want to save more money, the consequence is that the money-prices of goods and services will go down. Things will get cheaper to buy, because in order to attract sales, merchants will have to lower prices in order to entice more money out of savings. The high interest rates, or high price of money, will in turn serve to bring the money market back into equilibrium at times when the demand for money is high and prices low, as money-savers (lenders) will earn higher rates of return. This will earn savers more money on their savings, and in that way they will be enticed to spend the money they earned from their saving, bringing prices back up, money out of savings, and interest rates back down as lenders are forced to settle for lower interest rates in order to attract more borrowers again. The demand for money is thus lowered, enabling merchants to raise the money-prices of other goods and services, prices go up, demand for money down, and interest rates down. Eventually, this entire process reaches an equilibrium point where relative prices of goods and services in terms of money will stay more or less stable along with interest rates. Mining Company A has mined 100 kilos of silver, but needs them coined by a recognized and respected money coiner so he can buy stuff. Merchants don’t accept uncoined blobs of silver because there is no way to tell how pure the silver is. So he goes to Money Coiner B and gives him 100 kilos of silver. Money Coiner B puts the silver through his coining machine, checks its purity, and stamps it with his stamp of approval by coining it into little circles with his certification on it. He keeps 2 kilos of newly minted silver coins as a commission for his services. Mining Company A and Money Coiner B then go to Money Bank C and say, “Do me a favor Money Bank C. We have these coins here. They’re too heavy. Could you please put them in your vault and give us paper receipts that the silver is sitting here? Please give the silver to whoever presents you with the receipt.” Money Bank C takes the silver coins, provides them with receipts, and charges Mining Company A and Money Coiner B a small fee for storing the coins and providing the receipts. All parties go out and spend the paper receipts, AKA “money” in the economy and buy stuff. Since the prices of everything are going down, it will become cheaper for them to do the mining itself, increasing profit margins. Since the prices of everything are going down, the mining companies will be able to buy more stuff with the gold and silver they produce. These two factors will entice them to increase production of gold and silver, increasing the supply, bringing interest rates down and prices of other goods and services back up. When prices of other goods and services go back up, it will cost the mining companies more money to mine gold and silver, and they will be able to buy less with the gold and silver they mine. Eventually, profit margins for the gold and silver they mine will go down to a point where they will be forced to lower production. The supply of money will go down and the prices of goods and services back down again with it. In a free market for money, the best, most efficient, and most honest money coiners will get the most business and have the most coins circulating on the market. Those coining companies that cheat and lie about the purity of their coins will lose business and go bankrupt. Their coins will not circulate, or they will circulate at a discount. In a free market for money, the best, most efficient, and most honest money receipt issuers (currency printers, private banks) will store the most money and issue the most currency. Those private banks that cheat and lie about how much silver or gold they have in their vaults to match the receipts and “inflate” their currency will lose business, inspire their receipt holders to call in their receipts for silver and if they can’t provide it, they will go bankrupt. Their currency will not circulate, or it will circulate at a discount.. In a free market for money, you will have several different competing currencies and coinages, with people accepting the ones with the best reputations and rejecting the ones that are unreliable. Interest rates and prices will remain stable as money supply and money demand equilibrate, and as in any developed economy, goods and services will increase faster than the supply of money, allowing for a gently falling price level and everyone to get richer in real terms. Or you can have someone like Stan the Shekel Man Fischer in charge, printing sheets of paper backed by absolutely nothing, causing prices to continually rise and government controlled money to continually lose value, making everyone poorer and more miserable. Stanley Fischer did not save the Israeli economy from collapse. He simply did not abuse the insane power given to him as badly as other central bankers did: the monopoly power to print money. This power, incidentally, was given to him in much the same way as our fictional Stan Shoemaker’s was given to him: By a bully State ready and willing to arrest anyone besides Stan who manufactures shoes. Or in this case, money. And why would the Israeli government forbid anyone but Stan their goon from manufacturing money? Because when you have control over the entire money supply, you can spend it on anything…you…want. Like welfare. And leather seats for Knesset members. And armored cars for party heads. And first class trips to France for Defense Ministers. And subsidies to ignoramuses who you want to vote for you. And huge campaign posters and TV ads and God only knows what else. When one man controls the shoe market, the quality of shoes goes down and everyone who wears shoes, suffers. When one man controls the money market, the quality of money goes down. It loses value. It makes you poorer. Everyone who uses money, suffers. Every single time Stanley Fischer printed shekels with the flip of a switch, he stole from people like you and me who have to work to earn our shekels. He stole from you. He stole from me. 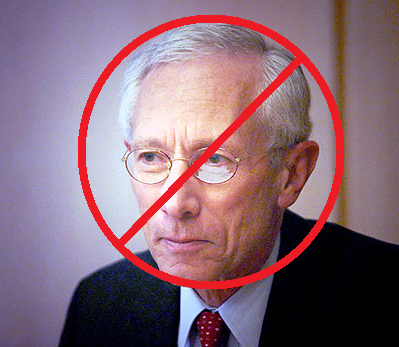 Stanley Fischer is a thief who should be arrested. He is not a hero who should be praised. If you want to make it impossible for Bibi to do anything stupid like dismantling outposts and robbing Jews of their land, then the best way to stop him is to vote Likud. The bigger it is, the less he can control it. If you vote Bennett, Likud will be smaller, he will have less internal Likud opposition, and Bibi will use Bennett like a spare tire. Bennett will join the coalition when Bibi needs him, and when Bibi wants to do something stupid like “peace negotiations” or “gestures to the Palestinians”, he’ll kick out Bennett and bring in Yesh Lapid or Karl “Yechimovich” Marx and do it anyway. The bigger Likud is, the more people in the coalition that cannot be kicked out at Bibi’s convenience. When Bibi wants to do something stupid, I’d rather he have 40 Likud MK’s to fight with that he can’t kick out rather than 30. Bibi wants the smallest Likud possible while still maintaining his PM seat. That’s why he kicked down Moshe Feiglin last time, and that’s why he launched a suicidal inane distasteful campaign against Bayit Yehudi this time. To get the right wingers disgusted with him so they’ll vote for an outside party that he can control with ease. So help us stop Bibi. Vote Likud. Make it so huge it’s unmanageable. Give Bibi hell. And if you really hate Likud and can’t bring yourself to do it, which is understandable, vote Aleh Yarok. I debate with some of the statists in Manhigut Yehudit, or the Jewish Leadership faction of the Likud, led by Moshe Feiglin. I’m the token anarcho capitalist in the group, supported by one other minarchist who is open to anarcho capitalism in theory. I’m at a slight disadvantage since I’m debating in Hebrew but all in all I’m not so bad at it. Aside from the constant male/female grammar mistakes I make over and over again, I get my point across well enough in slightly dumbed down language. The following is an exchange, my translation, that was absolutely fascinating and opened up new connections between Judaism, Halacha, and anarcho-capitalism. It began when one of the people in the group responded to my contention that the “Right of Return” should be abolished, all land privatized, and immigration regulated by the free market. My response, translated from my own Hebrew, was as follows, with a few additions. It seems there exist libertarians that are even more extreme than “the most extreme” and that I’m one of them. Greetings. They call us “anarcho capitalists”. The label “liberal” grosses me out because the connotation of the word implies forcing “liberal” values on the public like homosexuality and feminism and the like. I am not that type at all. My only value is live and let live, and the Torah and Judaism, for me at least, reflect that value in the most accurate way. And of course I believe in Torah from Sinai as a matter of historical fact. On that note, it is not the State’s responsibility to raise an army or police force. It is the responsibility of society generally through the free market. How does one raise an army without a government? Very simply. People generally buy insurance to protect their property. So individual people would hire a company or companies that carry weapons and tanks and planes as insurance in order to protect their property from outside threats. It is reasonable to assume that a subscription to a private regional army would cost a lot more money in border cities rather than in the middle of the country. What do we do if some deadbeat freeloader doesn’t want to pay the army subscription fee because he just doesn’t feel like it? It would be fairly easy to expel him from the regional or local economy without the use of force. The local supermarket owners could refuse to sell him food. Companies could refuse to hire him. The road owners could ban his car from the private roads, etc. With a private army, if such a company would allow even a single rocket to fall in an area under its jurisdiction, the army company would pay dearly. The “citizens” would be able to complain vociferously and directly to their army company to do what was necessary to crush the enemy within minutes, or pay the price from the wrath of its customers. No other foreign State would be able to condemn us for any military action no matter how swift and brutal in the UN because there would be no State to condemn in the first place, only a private army company. So too, if Jews desire to once again live in Gush Katif in Gaza, they would be able to hire a private army company to protect them there and simply rebuild the whole bloc anew. If armies were private, it is needless to say that the destruction of Gush Katif and the Jewish communities in Gaza would have been impossible. It is also needless to say that years beforehand, the Arabs in Gaza would have been either somewhere else, or still in Gaza but quiet, living in peace with a respectable job in some agricultural or construction firm under truly free Jewish bosses. By the way, the “borders” would be defined ad hoc by virtue of the Jews that live in the cities furthest out from the center of the country. If Jewish armies were private, no tiny settlement outpost would have been built surrounded by hundreds of thousands of Arabs. It would be too expensive to defend. Rather, settlement would proceed in an orderly fashion eastward as more territory in Judea and Samaria were bought up or conquered in a defensive war and settled by Jews, the border expanding slowly eastward. As for invasions, if an army company on the border needed help from another company to repel an invasion, they could work together on a financial arrangement between companies in the event of a war. First of all, thank you very much for your letter. The ideas were new to me so I read it several times. Thanks to your ideas (editor’s note, they are not mine) I also understood the position of the chachamim (sages) in Midrash Rabbah Shoftim that reject the appointment of a king. (Editor’s note, Midrash Rabbah is a compilation of Rabbinic exegesis on the Torah. Shoftim is the chapter where the mitzvah to appoint a King is discussed.) For a long time I thought the chachamim were against appointing a specific persona that functions as king, but in light of your words and rereading the Midrash, it is clear to me that they were describing a governmental system similar to what you describe here. Seemingly, this is also the opinion of Rabeinu Saadya Gaon (9th century Rabbi) and also the Ibn Ezra. This is all in contrast to the opinion of Rebbi Yehuda ibid, and several chapters in the Bavli (Babylonian Talmud) in tractate Sanhedrin that hold that appointing a King is an imperative mitzvah. Nevertheless, regarding practical application and the Jewish halachic vision of things, I have a lot to say about such an anarchic system. In the meantime, suffice it to say that this system notwithstanding, at the time when Joshua conquered Israel, he ruled monarchicly, and only after conquering and dividing the land, the path was open for a different kind of governmental regime. We are still in the phase of conquering and dividing the land. As to his final point, I believe he’s right. This is why I’m involved in “politics” in the first place even though I don’t believe in government. We have to free the country on a basic level first, and then move on to tearing down the rest. And I must say, I am now seriously considering reverting to the old Yerushalmi version of the Shmoneh Esreh and getting rid of the separate prayer for the House of David in my daily davening. There have been rumors and shmumors about America’s intention of minting a “trillion dollar coin” and sticking it in the Federal Reserve in order to bypass the so-called debt ceiling, which is more of a debt elevator. I couldn’t help but think of the Simpsons episode where the government prints a trillion dollar bill and Mr. Burns and Homer escape with it and somehow it ends up in the hands of Fidel Castro and the country survives on the wealth of the trillion dollar bill. It is rare that I am dumbfounded, but this time I really am. I don’t know what to say. The mere possibility of the minting of a trillion dollar coin is so despicably absurd that I’m overloaded with a litany of potential sarcastic remarks that none of them can fit through the door of my mouth as they’re all crowding together simultaneously and are now jammed in the back of my throat and I can hardly breathe. Jon Stewart did a pristine job I must say. Let me just start by saying that the source of this problem is that some primordial government, when it came in and seized the local mints and splayed the king’s face over all the coins, decided to give the monetary unit a proper name instead of a weight. For example, “dinars” instead of “ounces”. Then the Alice-in-Wonderland concept of “face value” was born, which doesn’t really exist. If instead of “dollars” the term for money was “grams” then money would be tied to weight instead of fancy shmancy names like “dollar” and the possibility of printing a gram of money or a “trillion gram coin” would be a lot more difficult for the government to do. So they had to rename the monetary unit to some imaginary term. If you’re going to mint a trillion dollar coin, why not mint 16 of them and pay off the national debt? Why make it out of platinum? Why not elephant dung? Better yet, you want mideast peace, right? And you love foreign aid and meddling. Then by God go all out! Why use it for such a petty thing as raising the “debt ceiling”? I say give the trillion dollar elephant dung to Israel, and then we can buy all of Syria, Jordan, Lebanon and Egypt and every single Arab in the country, pay them outrageous salaries to tap dance for us, and give them each their own personal trained pet chimpanzee to give them manicures and shiatsu massages and build them all gold-plated ivory mansions so they’ll be happy and won’t have to do anything after the daily tap dance for the Jews? Everyone over here will be rich, obviously, and therefore at peace. And the chimpanzee population will have a big boon. There’s only one problem. How are we doing to break a trillion to get all this done? The local Five and Dime? Or the Five and Trillion? And you want to use it to get around your stupid debt ceiling? My Lord the world has lost its mind. And don’t forget, there is nothing qualitatively different between a trillion dollar coin, and a one dollar bill. We commemorate Kristallnacht with vigils every year. But nobody remembers what happened the very next day, which was much more fateful. Hat tip EPJ. Jews around the world and in Israel – stay armed, stay safe. Jews (§5 of the First Regulations of the German Citizenship Law of 14 November 1935, Reichsgesetzblatt I, p. 1333) are prohibited from acquiring, possessing, and carrying firearms and ammunition, as well as truncheons or stabbing weapons. Those now possessing weapons and ammunition are at once to turn them over to the local police authority. Firearms and ammunition found in a Jew’s possession will be forfeited to the government without compensation. The Minister of the Interior may make exceptions to the Prohibition in §1 for Jews who are foreign nationals. He can entrust other authorities with this power. Whoever willfully or negligently violates the provisions of §1 will be punished with imprisonment and a fine. In especially severe cases of deliberate violations, the punishment is imprisonment in a penitentiary for up to five years. For the implementation of this regulation, the Minister of the Interior waives the necessary legal and administrative provisions. This regulation is valid in the state of Austria and in the Sudeten-German districts. Back in 2008 when I was still a Bill O’Reilly fan and a mainstream “neoconservative” type guy who loved the idea of spreading freedom with very powerful explosive devices throughout the world, I still didn’t like Barack Obama. It was on the Glenn Beck Program, who I am also no longer a fan of at all, that I heard some recordings of Obama talking on some radio show in Chicago about the failures of the Civil Rights movement in how they did not go far enough when they backed off from demanding court-ordered “redistributive measures”. Or something to that effect. I specifically remember the word “redistributive” rolling off Obama’s silver tongue like a drop of glue-based dew on a glistening fake house plant shining in Vaseline basking in the artificial light of a sun lamp. It sounded so seductive and scary. Government, benevolent and friendly and wanting to help the poor, seizes money by force from anything productive. Politicians take the money and start a welfare agency. The welfare agency provides paychecks for its bureaucrats, all of whom are friends of the politicians who seized the money. The benevolent welfare agency with the big heart runs out of money providing paychecks to all the bureaucrats running it before it hands out any stolen money to poor people, so the welfare agency lobbies for more money, which they use to expand the welfare agency and give more paychecks to more buddies of legislators, all of whom have huge hearts and went into the business of government bureaucracies to help poor people because they are so selfless. They run out of money again before they start doing anything, so they lobby Congress to steal more money from anything productive so they can do their job of eating paychecks more effectively, with huge big hearts of love and giving and benevolence. With production down, there’s less stuff, making everything more expensive and hurting everyone’s standard of living. Then we are told that in order to increase our standard of living, the government needs more money. A few months later, a welfare agency bureaucrat flips a quarter to a beggar on Capitol Hill, quintupling the amount of money given to the poor by the welfare system. The bureaucrat goes home all proud of himself for being such a selfless and giving human being and cashes his next paycheck. The government runs out of money again, so they call on Ben Bernanke to print it, in the name of stimulating the economy. Government thereby redistributes wealth from productive people to Congress’ best friends who out of the goodness of their souls, got jobs at a government welfare agency. Rafi and Natasha are paying 115 shekels a month in internet bills. Rafi and Natasha, those money grubbing selfish bastards with nothing but their own wallets on their minds all the time, look for a way to save money. All 115 shekels are going to the private money grubbing selfish internet company, which does nothing but think about how it can squeeze more money out of their greedy, miserly customers all day, every day. In a fit of pure selfishness and miserliness, Natasha calls Angloprotekzia, a selfish miserly money grubbing company that thinks about nothing but itself all day. This company, purely in order to extract money from its customers, not thinking of the poor at all, provides a service of private negotiation with other private companies, and promises to lower Rafi and Natasha’s internet bills. In exchange, Angloprotekzia gets half of the savings. In other words, they lower your bills in return for a commission. Angloprotekzia, smelling the opportunity for money, cash-register heart beating and dollar signs filling its greedy eyeballs, calls the internet company and gets them to lower the bill from 115 shekels a month to 24 shekels a month, saving Rafi and Natasha 91 shekels a month that they can now use to sit there and count again and again, reveling in their money. Or invest. Or buy something with, whatever. Previous score: Netvision 115, Rafi and Natasha 0. New score: Angloprotekzia 45.5, Rafi and Natasha 45.5, Netvision 24. Total = 115 shekel. Say it with me. Let it roll of your tongue…Redistributive. In this post I will try to give the libertarian answer to a problem that has been nagging at all of us incessantly. The answer will probably shock you, so be prepared. There’s a problem. There’s this thing called the Jewish democratic State. It needs a majority of Jewish persons in it in order to maintain its Jewish character. There are these Arabs in territories that the military of this Jewish State governs. If those territories are annexed as officially part of this Jewish State, then Jewish persons will no longer be the majority in the State. The Extreme Left Wing – Annex everything and give citizenship rights to everyone. Forget about a Jewish majority. Arabs are awesome. The Left Wing – Give the Arabs their own State so you won’t have to give them voting rights, thereby maintaining the Jewish majority. The Center – Don’t do anything. Just keep staying in power and hope nobody notices. The Right Wing – Annex everything, give human rights but no citizenship rights to any of the Arabs, and instead pay them to leave, thereby maintaining the Jewish majority. The Extreme Right Wing – Annex everything and kick all the Arabs out of the country. Jews are awesome. As a libertarian, I say all these solutions are wrong, and all of them are immoral to some extent because all of them assume that citizenship rights are a good thing. They are not. Why? Because as a citizen of the State of Israel, I am forced to use State-controlled money that loses value every day instead of being allowed to use gold or silver. I am forced to pay the government money for services I do not want. I am forced to use government controlled banks that only carry 10% of the money I put in them because the government gives them special privileges. I am forced to send my child to state prison every day until my child is 18, to be indoctrinated with whatever the State Education Minister wants his employees to indoctrinate her with. Usually, these employees are not skilled enough to indoctrinate, so they just end up babysitting at best. If I don’t send my children to these school-prisons, I myself will go to prison. I am forced to pay for these school-prisons in payroll taxes and excise taxes and value added taxes. I am forced to pay 8 shekels a liter for gasoline (roughly $8.25 a gallon), more than half of which goes directly to the State in taxes, to pay for roads that are constantly backed up every single day. I am forced to pay property taxes even if I’m only renting. Worst of all, I am forced, as a citizen of Israel, to risk my very life for 3 years in an inefficient boondoggle of an army as a slave with virtually no pay. The list goes on and on and on. In return for being robbed and having my children imprisoned and being forced into an army, I get the “right of return” as a Jew, which simply guarantees me the ability to move here without being kicked out or killed by the State. Essentially, the Jewish State guarantees me that, if I am about to be killed by a different State, I can go to the Jewish one and they promise not to kill me on purpose because I’m Jewish (though I may get killed in army service for the State). They won’t kill me, they will only enslave me and my children. But, people will say, if I don’t like something about the State, I have a right to vote. Voting, essentially, is the right to have a tiny meaningless say about who will get a piece of my stolen money that will first be filtered through bureaucratic systems of government workers who will consume most of the money before it gets to anyone else. This is what makes every sector in Israel hate every other sector in Israel. The State, which pits everyone against everyone else and makes people hate each other for directing their stolen money somewhere else. Think Haredi public schools, Government stipends, Leftist public universities, army exemptions, funding for “settlements”. Citizenship rights are not rights. They are liabilities, peppered with a tiny ray of hope that never materializes called “voting”. It reminds me of that line from The Hunger Games where Donald Sutherland explains why the Hunger Games take place. Why take one tribute from each district and make them all battle to the death, winner take all? Why not just kill them all? Because in order to control and enslave people, you have to give them hope. The hope that they will win the battle. Otherwise they will revolt. In statist terms, the hope that their vote will change something. Otherwise, there will probably be a revolution. Being a citizen of a State means you will be stolen from and enslaved. So, the libertarian solution to the Israeli-Arab conflict is not to either grant citizenship or not grant citizenship to Arabs. It is to abolish citizenship itself for everyone. First of all, generally speaking, Israel in the period of the Shoftim was basically a stateless libertarian society. So there is precedent, and it was the most peaceful period of Jewish history counting the number of years between skirmishes. What about the right of return? The answer is, without a state, bringing Jews back to Israel will be a matter of private funding. If Jews want to come, they can come, just as before. No restrictions. Nothing changes. What about keeping Arabs out, or other potential threats from flooding the country? It becomes a bidding war. If it is really important to keep Arabs or anyone else out, then the Jewish people themselves will be responsible for keeping private land in Jewish hands. (An interesting factoid is that almost all of the land sales to non-Jewish hands are through the Israeli Government itself, not private Jews. Surprise surprise.) Those that sell to Arabs can be voluntarily boycotted and expelled from the economy if people think it’s important to do that. Arabs that are here can be voluntarily bought out by rich Jewish interests, and there are plenty that would pay. It’s a question of who wants the land more and who can be bought out – the Jews or the Arabs? If no one is a “citizen” of Israel, then every question – army, courts, land, roads, healthcare, immigration, emigration – becomes a question of whether you trust the Jewish people can voluntarily organize themselves through the free market to keep the nation together in their homeland or not. In a free Israel, I would be proud to serve in the army voluntarily. It could be funded by voluntary contributions instead of taxes. The Jewish people could devise a system where those who pay get special card. The card could be required by private businesses who will only sell to people who contribute to national defense. Those who don’t would be forced into a corner and concentrated together geographically, as they would be expelled from all other local economies by private businesses refusing to do business with them. In a free Israel, all roads would be private. They would be more expensive during rush hour and cheaper at other times, spreading out traffic by the price system and keeping things moving. This would also bring down the price of gas drastically. In a free Israel, holy sites like the Kotel and Temple Mount would be privatized. People would pay a gram of silver (shekel is State money, there wouldn’t be any) to get in, and the owner would insure the policy that would make him the most money, such as special hours for Women at the Wall time, special hours for traditionalists etc., all parsed by supply and demand. The owner of the Temple Mount, whether all of Am Yisrael via shares of stock, or a single private owner or corporation, would decide whether he would allow Jews to pray there or not. He would probably allow it. He would be responsible for private security of the Mount. There would be police companies hired by groups of people by geographic location. Haifa would have one police company. Jerusalem another. Those who did not pay the police bill would end up paying it anyway if they called the police for whatever reason, who would then charge them for services on the fly at a premium for not having a subscription. They would function as an insurance company. The courts would be private people with reputations for being fair and fast. The fairest and fastest ones would be called upon the most and make the most money for judging the most cases. Say someone breaks into your house and steals your TV. You call the police company to investigate. They find the suspect and force him into a court of any judge both parties accept. If it turns out he is the culprit, the police did not violate the rights of an innocent person, and part of the cost of the police is paid by the culprit, as well as the salary of the judge. If the police got the wrong man, they are fined by the court for violating the rights of an innocent person. The only law of the land would be, “Do not violate the person or property of any human being.” The job of any private court would be to apply that law to any and every case at hand. Armed police or army cannot conquer the area and enslave other Jews because everyone is free to be armed individually. Is this really possible? I believe it is. All the other annoying unsolvable questions melt away if you believe in freedom. We have plenty of money, plenty of will, and plenty of ingenuity. We don’t need a State to babysit us or imprison us or steal our money and pretend to solve problems we can solve ourselves. God did not take us out of Egypt to be enslaved to a State. Am Yisrael Chai. Not Medinat Yisrael Chai.